Late last year, former Concrete resident Robert DiLeo, Jr. stood on a neighbor’s front porch, dried blood in his left ear and numerous cuts on his face. He knocked on the door and asked for some plastic sheeting to create a temporary window on the driver’s side of the family car. During the wee hours that morning, DiLeo had hit a bull elk a few miles west of Concrete. His father, Robert DiLeo Sr. and his brother, Joseph, were in the car with him when the elk slammed into the driver’s side door, shattering the window and showering the car’s occupants with glass shards, some of which ended up in the back window, with elk hair and blood. Young DiLeo barely had time to duck. “If I hadn’t, I’d be dead,” he said. Stories of elk encounters with moving vehicles are becoming more and more common in the Upper Skagit Valley, as the primary Nooksack herd and its sub-herds have swelled in number. There’s historical evidence that elk were living in the Skagit and Whatcom county areas long before white pioneers showed up; some Indian burial grounds have elk bones that date back 2,000 years. It is known, however, that Washington state transplanted elk to this area from Yellowstone National Park in the ’teens and ’20s, and again in the 1940s. Elk from the Mt. St. Helens and Chehalis area were brought in during the 1990s and early 2000s. 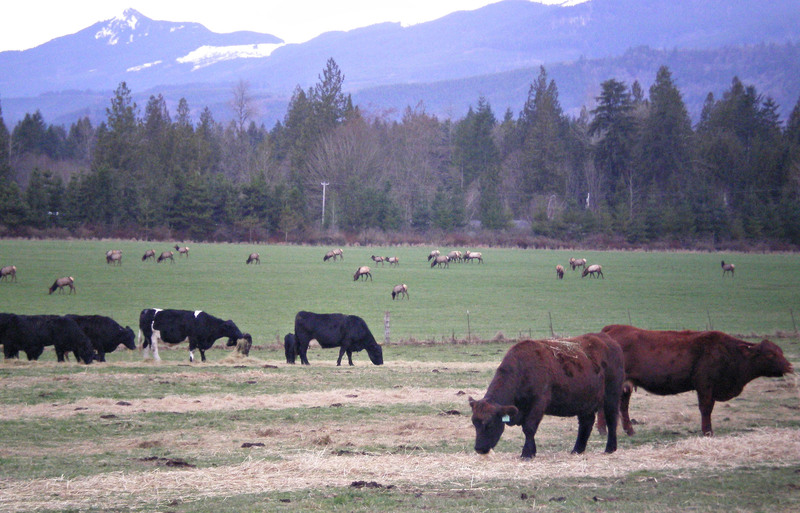 What we now call the Nooksack herd has splintered into six or seven sub-herds that live mostly between Concrete and Sedro-Woolley. The vast majority of the Nooksack herd, however, stays up in the Nooksack River drainage area, according to Rich Philips, the Upper Skagit police sergeant for Washington Fish and Wildlife. “Only a small percentage is causing the damage problem,” said Philips. In the 1970s and ’80s, the elk population in the Upper Valley grew to 1,400 to 1,500 animals. But because of habitat changes and increased state and tribal hunting, the population dipped to about 300 animals in the mid-1990s. “Social tolerance for elk was very high when the population was low—residents didn’t see them,” said Philips. In the early 1990s, the state and tribes agreed to a conservation closure: No elk hunting, period. With habitat improvement, the population rebounded “and now during the past few years, we’ve found ourselves up around 1,400 to 1,500 animals,” said Philips. In the meantime, more people moved to the Upper Valley. They started organic farms and vineyards. They’re raising cattle and potatoes. Kleinhuizen said an elk herd of 43 to 45 head moved into her pastures during the third week of last October, and mostly stayed put through March. They left behind 1.5 miles—miles—of wrecked barbed wire and electric fencing, and 80 acres of pasture land that was grazed so close to the ground that Kleinhuizen’s 200-plus cows, calves, heifers, and yearlings have to be fed with store-bought hay while she waits weeks for the pastures to recover. Between the hay, replacement fence materials, and labor, Kleinhuizen estimates she’s already spent $10,000. “It was a sucker punch of two hits—the fencing and the grass,” she said. “And who knows how that will carry over into summer and fall grazing. It could be another $5,000 to $10,000 hit. They ate probably about $10,000 worth of grass. That kind of talk is unwelcome in this part of the valley. Kleinhuizen is an Ovenell—a name that reaches back decades. The family has been ranching here since 1940, but Kleinhuizen said they have never seen this level of elk damage. Area ranchers and farmers were incensed late last year when they heard of the state’s plan to increase the Nooksack elk herd to approximately 1,900 head. During an Oct. 18 meeting in Grasmere, a large gathering of area farmers and ranchers met with state and local officials and Skagit County Farm Bureau representatives to discuss the problems associated with too many elk. Representatives from Mears Field—the Concrete airport—were there too, after an elk sub-herd made the airport its home for more than a week. The meeting was surprisingly even-tempered, despite the fact that many ranchers and farmers had depressing stories to tell of their run-ins with elk. They tore into wrapped bales of hay, ruining them when the weather turned sour. They stomped through potato fields. They pushed through fences. “Do you really need to increase the herd by another 500 head?” asked one farmer. State officials say the additional elk would not be located in the Skagit River valley; rather, “the goal would be to increase [the elk population] on public land south and east of Concrete, in the Finney area, which is owned by DNR and the Forest Service,” said Philips. Other strategies for managing the herd in the valley include increased hunting opportunities for state and tribal hunters. How does one convince a herd of wild animals to stay where you want them? Forage enhancement might work, said Philips. Or habitat manipulation to draw the elk off the valley floor: Give them something that’s equally good—or better—to eat. With every year that goes by, the danger level rises on SR 20 and local farmers hold their breath. Anecdotal evidence of increased vehicle-elk accidents is starting to jibe with data coming from area tribes, the state, and WSDOT. In 2012, those three entities documented 50 car-elk accidents on SR 20 between Sedro-Woolley and Concrete. Philips has been working on this issue for two years and said the complexity of the issue is surprising, since there are more moving parts to it than most people realize. A plan is being formulated. But for Kleinhuizen, hunting permits are a short-term solution. “They’re going to have to change something,” she said.